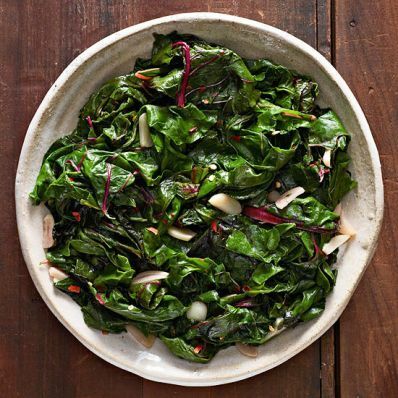 1 of 3 Remove stems from chard and slice into 1-inch pieces. Wash and place in a bowl. Roughly chop leaves, wash and place in a separate bowl. 2 of 3 In a large, lidded pot, heat olive oil over medium heat. Add garlic and red pepper flakes to pan. Cook 1 to 2 minutes, being careful not to burn garlic. Stir in chard stems; increase heat to medium-high and cook 4 minutes. Add chard leaves and place lid on pot for 2 minutes. Remove lid and stir with tongs. Replace lid for 2 more minutes. Remove lid, stir and cook for 2 more minutes, uncovered. Stir in salt. 3 of 3 Transfer cooked chard to a serving dish, allowing excess liquid to drip back into pot.